Times have changed. In today’s world everything is moving online. This is where people get their shopping done, order their food and most importantly, plan their travels. That’s why your website needs a great cab booking software to attract customers. For an affordable price we provide a complete tool that can meet all your taxi booking needs. What are some of the main benefits of running EasyTaxiOffice? The whole booking process has been simplified to please even the least tech-savvy customers: potential clients will appreciate being able to book their journey in less than a minute. Keep it simple and observe your numbers going up! The process of integrating new tools with your website might seem scary, but our team will get everything up and running in close to no time. You will be guided through every step of the transition and advised on how to best take advantage of the new, powerful tools at your disposal. EasyTaxiOffice might be the best choice your company has ever made. Use the precise, online booking overview to steer the company in the right direction. Enjoy higher incomes and cut costs by switching to our affordable cab booking software. 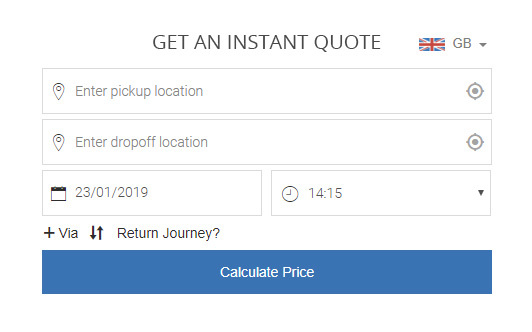 Your homepage will feature a quick quote box where clients enter the departure and arrival postcode to instantly get a precise cost estimate. In the next step, choose a desired vehicle from the list. The cost of the journey is displayed beside the cart. After you register a new account or log into an existing one, you need to fill in the remaining details of your journey. After that, choose a payment method (PayPal, cash, credit, debit card, etc.) and be on your way! The instant quote box is also available in a horizontal form. Having a proper online booking platform is a must-have for any company which wishes to compete in today’s market. Multiple studies have shown that most bookings nowadays are completed online and via mobile apps with only a small percentage of clients sticking to traditional methods. This trend will only grow stronger. The EasyTaxiOffice set of tools prepares you for these changes and gives you the upper hand. Get in the driver’s seat and overtake your competition. The system helps eliminate mispricing and inspire confidence in regular customers though auto generation of prices based on your company’s custom pricing matrix.